Now on display at the Frank and Anne Piskor Reading room in Owen D. Young Library is an exhibit of Adirondack Poetry - created by Holly Brown '14. The exhibit will be on display until December 20th, 2013. 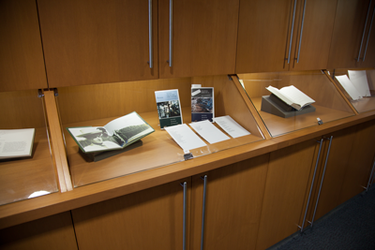 The majority of books and journals in this exhibit come from the library's collections. We gratefully acknowledge the loan of several titles from the collections of Edward Comstock Jr. of Saranac Lake, New York.